The Big Metronome™…is a must own for any instrumentalist. How to develop a better internal sense of time. Feel music on a more macro level. Develop an innate sense of musical form. Develop a more natural feel that breathes with the music. All this is accomplished by requiring the student to “feel time” Don’t “count time.” The Big Metronome is filled with numerous exercises and comes with audio files to play along with each exercise. Each audio track for The Big Metronome™ gives you a two bar count off and then a click every measure, two measures or four measures. As this pulse happens at wider and wider periods of time it requires the student to rely more and more on their own internal sense of time. Although The Big Metronome does contain 3 CDs worth of audio in the ebook it could also contain MP3s for all metronome markings with a click for either every measure, two measure and four measures. It is recommended that you also purchase the additional MP3 audio downloads that available to get all these combinations. The most complete additional audio is the “Big Metronome Bundle 1” which contains over 45 hours of MP3s with every traditional metronome marking with every macro beat up to 8. This is a huge resource and highly recommended to get the most out of this book and time concept. 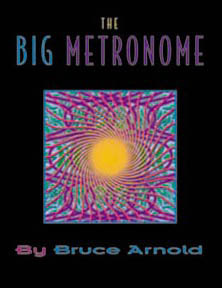 Get The Big Metronome™…download today! Status: Digital book is available for immediate access. What should I work on after The Big Metronome™? Each student has different goals and reasons for working with the The Big Metronome for recommendations for further study please contact Mr. Arnold at the link at bottom of page. Over the years we have had many requests for additional audio files to cover different tempos and different time signatures so that students could use these files in multiple situations. We have therefore created additional digital downloads of other audio files that will aid you in your development. These are the settings on a traditional metronome. Each download is giving you the equivalent of 5 Audio CDs worth of audio. We also offer bundles of these downloads at a reduced price. These bundles contain about 40 Audio CDs worth of files. Keep in mind that bundles are rather large files and the download could take a few minutes. Click on title to go directly to MP3 downloads. Volumes 1 through 8 of 4/4 meter with time divisions 1-8 measures. This package contains Big Metronome™ Volume 1 through 8 in one download. This is the combination of the eight volumes listed above. This package includes MP3 for all traditional metronome markings with a click for 1-8 measures. This bundle contains almost 300 MP3 files. The following metronome markings are used with time divisions of 1 through 8 measures. 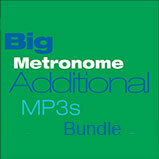 Get Big Metronome™ Bundle 1…download today! Status: In stock, Digital MP3s are available for immediate access. No physical CDs available. The Big Metronome™ Additional Files Volume One includes MP3s for all traditional metronome markings with a click every 1 measures. This download is also included in the bundle 1. Get Big Metronome MP3 Volume One…download today! The Big Metronome Additional Files Volume Two includes MP3s for all traditional metronome markings with a click every 2 measures. This download is also included in the bundle 1. Get Big Metronome™ MP3 Volume Two…download today! The Big Metronome™ Additional Files Volume Three includes MP3s for all traditional metronome markings with a click every 3 measures. This download is also included in the bundle 1. Get Big Metronome MP3 Volume Three…download today! The Big Metronome™ Additional Files Volume Four includes MP3s for all traditional metronome markings with a click every 4 measures. This download is also included in the bundle 1. Get Big Metronome MP3 Volume Four…download today! The Big Metronome™ Additional Files Volume One includes MP3s for all traditional metronome markings with a click every 5 measures. This download is also included in the bundle 1. Get Big Metronome MP3 Volume Five…download today! The Big Metronome™ Additional Files Volume Six includes MP3s for all traditional metronome markings with a click every 6 measures. This download is also included in the bundle 1. Get Big Metronome MP3 Volume Six…download today! Status: In stock, Digital MP3s available for immediate access. The Big Metronome Additional Files Volume Seven includes MP3s for all traditional metronome markings with a click every 7 measures. This download is also included in the bundle 1. Get Big Metronome™ MP3 Volume Seven…download today! The Big Metronome™ Additional Files Volume Eight includes MP3s for all traditional metronome markings with a click every 8 measures. This download is also included in the bundle 1. Get Big Metronome MP3 Volume Eighth…download today! Have a story or a review you want to submit. We would love to hear from you please send us an email. This entry was posted in Instrumentalists, Time Studies and tagged time, exercises, rhythm, Timing, audio, book, mp3, feel, count, metronome, feel time don't count time by Bruce Arnold. Bookmark the permalink.